Are dental amalgams safe? Is it possible to have an allergic reaction to amalgam? Is it true that dental amalgams have been banned in other countries? Is there a filling material that matches tooth color? If my tooth doesn't hurt and my filling is still in place, why would the filling need to be replaced? Read this interesting and informative discussion from the American Dental Association. The Food and Drug Administration and other organizations of the U.S. Public Health Service (USPHS) continue to investigate the safety of amalgams used in dental restorations (fillings). However, no valid scientific evidence has shown that amalgams cause harm to patients with dental restorations, except in rare cases of allergic reactions. The Centers for Disease Control and Prevention offers some scientific background on mercury (contained within silver-colored fillings), and whether it believes the substance presents any health hazards. Children have significantly less tooth decay in their primary (baby) and permanent teeth today than they did in the early 1970s, according to the Journal of the American Dental Association (JADA). The analysis reveals that among children between the ages of six and 18 years, the percentage of decayed permanent teeth decreased by 57.2 percent over a 20-year period. In addition, children between the ages of two and 10 years experienced a drop of nearly 40 percent in diseased or decayed primary teeth. Advances in modern dental materials and techniques increasingly offer new ways to create more pleasing, natural-looking smiles. Researchers are continuing their often decades-long work developing esthetic materials, such as ceramic and plastic compounds that mimic the appearance of natural teeth. As a result, dentists and patients today have several choices when it comes to selecting materials used to repair missing, worn, damaged or decayed teeth. The advent of these new materials has not eliminated the usefulness of more traditional dental restoratives, which include gold, base metal alloys and dental amalgam. The strength and durability of traditional dental materials continue to make them useful for situations where restored teeth must withstand extreme forces that result from chewing, such as in the back of the mouth. Alternatives to amalgam, such as cast gold restorations, porcelain, and composite resins are more expensive. Gold and porcelain restorations take longer to make and can require two appointments. Composite resins, or white fillings, are esthetically appealing, but require a longer time to place. Composite fillings - Composite fillings are a mixture of acrylic resin and finely ground glasslike particles that produce a tooth-colored restoration. Composite fillings provide good durability and resistance to fracture in small-to-mid size restorations that need to withstand moderate chewing pressure. Less tooth structure is removed when the dentist prepares the tooth, and this may result in a smaller filling than that of an amalgam. Composites can also be "bonded" or adhesively held in a cavity, often allowing the dentist to make a more conservative repair to the tooth. In teeth where chewing loads are high, composite fillings are less resistant to wear than silver amalgams. It also takes longer to place a composite filling. Ionomers - Glass ionomers are tooth-colored materials made of a mixture of acrylic acids and fine glass powders that are used to fill cavities, particularly those on the root surfaces of teeth. Glass ionomers can release a small amount of fluoride that help patients who are at high risk for decay. Glass ionomers are primarily used as small fillings in areas that need not withstand heavy chewing pressure. Because they have a low resistance to fracture, glass ionomers are mostly used in small non-load bearing fillings (those between the teeth) or on the roots of teeth. Resin ionomers also are made from glass filler with acrylic acids and acrylic resin. They also are used for non-load bearing fillings (between the teeth) and they have low to moderate resistance to fracture. Ionomers experience high wear when placed on chewing surfaces. Both glass and resin ionomers mimic natural tooth color but lack the natural translucency of enamel. Both types are well tolerated by patients with only rare occurrences of allergic response. Porcelain (ceramic) dental materials - All-porcelain (ceramic) dental materials include porcelain, ceramic or glasslike fillings and crowns. 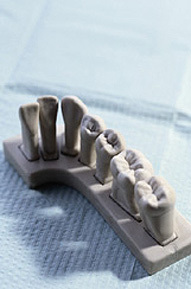 They are used as inlays, onlays, crowns and aesthetic veneers. A veneer is a very thin shell of porcelain that can replace or cover part of the enamel of the tooth. All-porcelain (ceramic) restorations are particularly desirable because their color and translucency mimic natural tooth enamel. All-porcelain restorations require a minimum of two visits and possibly more. The restorations are prone to fracture when placed under tension or on impact. Their strength depends on an adequate thickness of porcelain and the ability to be bonded to the underlying tooth. They are highly resistant to wear but the porcelain can quickly wear opposing teeth if the porcelain surface becomes rough. Research has shown that almost everybody has a 95 percent chance of eventually experiencing cavities in the pits and grooves of their teeth. Sealants were developed in the 1950s and first became available commercially in the early 1970s. The first sealant was accepted by the American Dental Association Council on Dental Therapeutics in 1972. Sealants work by filling in the crevasses on the chewing surfaces of the teeth. This shuts out food particles that could get caught in the teeth, causing cavities. The application is fast and comfortable and can effectively protect teeth for many years. In fact, research has shown that sealants actually stop cavities when placed on top of a slightly decayed tooth by sealing off the supply of nutrients to the bacteria that causes a cavity. Sealants act as a barrier to prevent bacteria and food from collecting and sitting on the grooves and pits of teeth. Sealants are best suited for permanent first molars, which erupt around the age of 6, and second molars, which erupt around the age of 12. Sealants are most effective when applied as soon as the tooth has fully come in. Because of this, children derive the greatest benefit from sealants because of the newness of their teeth. Research has shown that more than 65% of all cavities occur in the narrow pits and grooves of a child`s newly erupted teeth because of trapped food particles and bacteria. Sealant application involves cleaning the surface of the tooth and rinsing the surface to remove all traces of the cleaning agent. An etching solution or gel is applied to the enamel surface of the tooth, including the pits and grooves. After 15 seconds, the solution is thoroughly rinsed away with water. After the site is dried, the sealant material is applied and allowed to harden by using a special curing light. Sealants normally last about five years. Sealants should always be examined at the child`s regular checkup. Sealants are extremely effective in preventing decay in the chewing surfaces of the back teeth. Insurance coverage for sealant procedures is increasing, but still minimal. Many dentists expect this trend to change as insurers become more convinced that sealants can help reduce future dental expenses and protect the teeth from more aggressive forms of treatment. Dentist in White Lake MI David J. Campbell DDS 7110 Highland Road White Lake, MI 48383 (248) 887-8387 Call For Pricing!